The development of the chain drive helped make the bicycle that we know today possible. The chain drive eliminated the need to have the cyclist directly above the wheel. Instead the cyclist could be positioned between the two wheels for better balance. With the advent of gears, the cyclist could also pedal more efficiently. Riders enjoyed increased speed and easier riding up steep grades. A modern chain drive and derailleur system. Leonardo Da Vinci is credited with developing the idea of the chain and cog in the 15th century. However, it took nearly 400 years for the idea to become a practical aspect of bicycle design. For a chain drive to be effective it needs to transmit power efficiently from the rider's legs to the back wheel. It also must be designed so that pedaling resistance is within a comfortable range for the cyclist. The development of stronger materials and other technological and engineering advances made this possible. By the 1880s, the chain drive was commonplace. A chain drive alone (without gears) is effective on flat surfaces and going downhill. However, when it comes to headwinds, hill climbing, and even starting on a bicycle without gears--the cyclist has to stand on his pedals and strain while pedaling at a very low rate. Gears allow the cyclist to pedal at a comfortable and efficient rate while traveling either uphill or downhill or with a headwind or a tailwind. On the old high-wheelers, the pedals were attached directly to the wheel. One turn of the pedals equaled one turn of the wheel. Gears allows the cyclist to change that ratio. For steep hills, we choose a gear that lets us turn the pedals many times to turn the wheel just once; on flats or downhills, we might choose a gear that turns the wheel many times for each turn of the pedals. PAUL de VIVIE, alias "Velocio"
One of the greatest developers and proponents of the derailleur was the Frenchman Paul de Vivie (1853-1930). A passionate advocate of cycling, he rode his first high-wheeler at the age of 28, and soon had sold his silk business and started a bike shop. He also founded the magazine Le Cycliste in 1887, where he wrote under the nom de plume "Velocio," touting the joys and benefits of cycling. A tireless inventor, he was convinced that geared bikes, then an oddity, were the future of cycling. Though existing gear-changers were awkward and unreliable, Velocio was undeterred. He spent much time inventing various gearing schemes. In 1905 he tested a two-speed derailleur called the Cyclist. Through his efforts in both engineering and publicity, the derailleur was ultimately perfected, and a relatively dependable version was produced by Tullio Campagnolo in 1933. Paul Doherty, Senior Scientist at the Exploratorium, explains the gear ratio on your bicycle. With this method you simply count the number of teeth in front chain ring and then the number of teeth in one of the rear chain cogs. 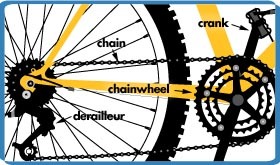 In the example Paul created, the front chain ring had 54 teeth and the rear cog had 27. "That means every time I pedal around once on the front chain ring, the chain goes around 54 teeth. That means a 27-tooth (rear) cog goes around twice (rotating the rear wheel twice)." This would provide a ratio of 2-to-1. If the rear cog had 11 teeth, the ratio would be closer to 5-to-1 and so on. This animation demonstrates the rotation of the front and rear cogs of a bicycle. Notice that for each turn of the larger front cog the rear cog turns twice. The animation also produces an interesting optical illusion where the "spokes" on the front cog appear to be moving backward. The Exploratorium's Paul Doherty talks about gear ratios.